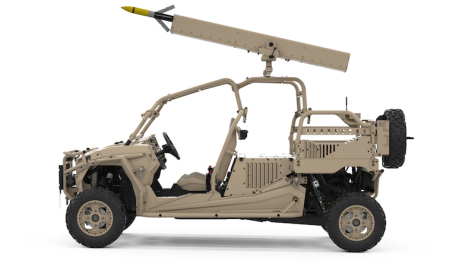 Arnold Defense, the St Louis based manufacturer of 2.75-inch rocket launchers, is pleased to announce receipt of the first order for their unique FLETCHER Land Based, Laser Guided Rocket Launcher. The FLETCHER 2.75-inch/70mm weapon system was first unveiled just 18 months ago at DSEi in London. Since the launch, FLETCHER has been showcased at a number of international exhibitions, generating exceptional levels of interest whilst Arnold Defense have continued with an ongoing development and investment program to broaden and prove the system’s already revolutionary capability. The first customer for the FLETCHER system, who cannot yet be disclosed, has committed to purchasing FLETCHER due to the system’s ability to accurately engage targets at a range of over 5km, with a 100% hit rate in recent test-firings. This first order is for an initial batch of launchers, with a larger order expected to follow once successful user trials and demonstrations have been completed. Arnold Defense has manufactured more than 1.2 million 2.75-inch rocket launchers since 1961 for the U.S. Army, U.S. Navy, U.S. Air Force and many NATO customers. They are the world’s largest supplier of rocket launchers for military aircraft, vessels and vehicles. The Company, located just south of St. Louis, Missouri, employs professional fabricators, welders, electronic engineers and quality control experts who manufacture thousands of rocket launchers annually.